Jens Soering, the German national convicted of the brutal homicide of his girlfriend’s Bedford County parents in 1985, has a new ally in his corner. In a letter to Gov. Terry McAuliffe dated Tuesday, Albemarle County Sheriff J.E. “Chip” Harding expressed his opinion that Soering was wrongfully convicted of the murders of Derek and Nancy Haysom. 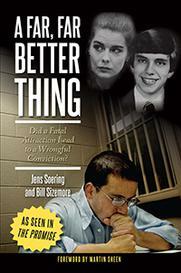 Soering has maintained his innocence since his conviction in 1990 and has since been denied parole 11 times. Soering’s attorney, Steven Rosenfield, will submit the letter to the governor’s office as part of the second supplement to his petition for pardon, which also will include new information about blood stains collected at the scene of the crime. A new review of the DNA and serology (forensic testing used prior to DNA testing) of the blood suggests there may have been two unidentified males present at the time of the killings. “All of this is to aid the governor with his determination,” said Rosenfield. The Haysoms were killed in their Bedford County home on March 30, 1985, when their daughter and Soering were students at the University of Virginia. The Haysoms were found with dozens of stab wounds and their throats cut from ear to ear. Their daughter, Elizabeth Haysom, pleaded guilty to first degree murder as an accessory before the fact. She currently is serving a 90-year sentence, but will receive mandatory parole in 2032, when she is 68 years old. Rosenfield approached Harding a couple of months ago and asked him to review the details of the case. Citing Harding’s extensive law enforcement career, Rosenfield said he believes this is the first time a sheriff has written a letter of this kind in support of a petition for pardon. “He is probably the most experienced law enforcement investigator I have ever known,” Rosenfield said. For his part, Harding took on the case because he said investigation work has always been an important part of his job. Harding served almost 30 years with the Charlottesville Police Department, most of which was in investigations. After reading John Grisham’s book “The Innocent Man,” Harding said it opened his eyes to mistakes made within the criminal justice system. “It made me realize everything we’re doing in law enforcement isn’t right all the time,” Harding said. Not long after reading the book, Harding became involved with the Innocence Project and assisted in an investigation of the conviction of Michael Hash in Culpeper. Hash served 10 years of a life sentence for the murder of Thelma Scroggins in 1996, but has since been cleared of wrongdoing and freed. When Harding agreed to look over the Soering case, he went into it with the belief that Soering was probably guilty, he said. 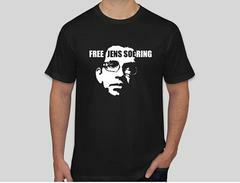 But as he looked through the court transcripts, reviewed the evidence and interviewed Soering in prison, he realized that it was unlikely Soering would be convicted if the trial were held today. “I completely changed my mind,” Harding said. In his letter, Harding breaks the facts down into blood evidence, sock evidence, shoe impressions in blood, Soering’s recanted confession, the alibi and night of the crime, Elizabeth Haysom’s confession, the motive and the serology and DNA evidence. Harding is working pro bono on the case. Harding structures his letter around analyzing the closing arguments made by prosecutor James Updike and the main evidence used to convict Soering. One of Updike’s most compelling pieces of evidence was Type O blood left at the scene of the crime, which didn’t match either of the victims, nor their daughter. Therefore, Updike said, the blood must have belonged to the killer. The problem, Harding writes, is that the DNA testing done in 2009 on the blood stains concluded that the Type O blood does not belong to Soering. “Who left the blood at the crime scene is unknown at this time,” wrote Harding. Bloody sock and shoe prints found at the scene also were attributed to Soering, but Harding said both prints were much too small to match Soering’s feet. Instead, the prints likely were made by a woman wearing size 6 ½ to 7 ½ shoes or a man wearing size 5 to 6 shoes. As for Soering’s recanted confession, Harding points out multiple inconsistent statements that do not match evidence found at the scene. When he first spoke to police, Soering told detectives that Nancy Haysom was wearing jeans the night of the murders, but she was actually wearing a flowery housecoat. Soering also said he cut each victim’s throat before running out of the house. Their throats were cut, but Derek Haysom also was stabbed 11 times in the chest and 14 times in the back, while Nancy Haysom also was stabbed multiple times. Soering reportedly never said anything about the additional injuries. “I was amazed this was not questioned,” Harding wrote. There also was blood evidence that indicated someone took a shower after the murders, but Soering never mentioned that. Soering also said that after Derek Haysom pushed him, Soering fell back and bumped his head on the wall, but in the crime scene photos, there was a window, not a wall. Harding also questioned the alibis given by Soering and Haysom. Each said they stayed behind in Washington, D.C. while the other left. But Haysom said that when Soering returned in a rental car — after presumably murdering her parents — he was wrapped in a sheet and covered in blood. But Harding said no traces of blood were ever recovered from the car. Instead, Harding lays out pieces of evidence that support a conclusion that Haysom was at the scene. Haysom’s Type B blood was found near her mother’s body; the brand of cigarettes she smoked were found outside of the front and back doors; the shoe print found at the scene was consistent with her shoe size; she openly hated her mother; she had the best opportunity to shower after the crime and change her clothes, thus leaving no blood in the rental car; and she confessed to the killings, Harding wrote. And, Harding wrote, Soering would have had no real motive to kill Haysom’s parents. Harding also interviewed Carlos Santos, who covered the trial as a reporter at the Richmond Times-Dispatch, and Frank Green, a current reporter with the Times-Dispatch. Both told Harding that Haysom told them in interviews that she committing perjury at Soering’s trial. She also told them that her mother had been sexually abusing her for years prior to the murders, they said. In one of his final points, Harding refers to a new report by Dr. Moses Schanfield, a professor of forensic science and expert witness, that shows Soering must be excluded as the donor of unidentified blood stains found at the scene. Rather, the DNA evidence supports the conclusion that two unknown men left blood at the scene. In his theory of the case, Harding said he believes Haysom was at her parents’ home at the time of the murders and was assisted by two men. Harding said he does not believe Soering was there because there is no evidence that ties him to the scene, and that Haysom had a much greater motive to kill her parents. Harding will continue to investigate the case, but said he hopes to see Soering get at least a conditional pardon from McAuliffe that would allow him to go home to Germany. The governor’s office has opened an active investigation, according to Rosenfield, but it could take several months to hear anything. Harding said he also is concerned there are two men who have escaped justice for the past 32 years.